Monel stub ends. 304 stainless steel casing covers the outside of the assembly. 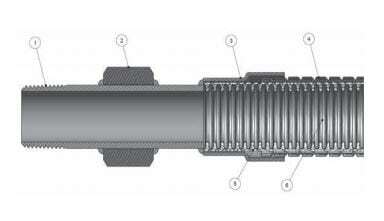 The hose assemblies are manufactured in accordance with the Chlorine Institute pamphlet 6 current addition. TUBING MATERIAL: Corrugated Monel 400 tubing conforms to ASTM B‐127, Monel alloy UNS No. N04400. BRAID MATERIAL: Monel 400 wire conforms to QQ‐N‐281 Rev D. Monel alloy UNS No. N04400.